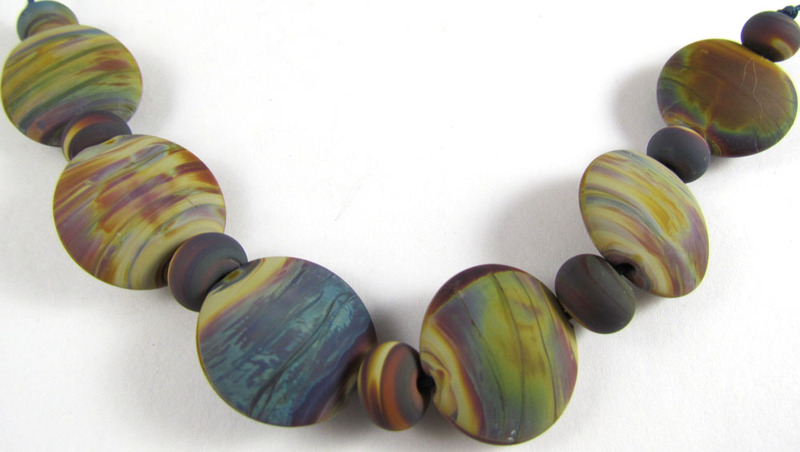 I’m about to get back on my torch and make more “raku” glass beads. They are one of my best sellers and the color range that comes from this rod of glass is awesome. So I went looking around the internets looking for information to share with all of you about this glass and found some from none other than Lori Greenberg, the former Glass Arts Editor over here at Craft Gossip. So check out what she says about it…and then check out what Dawn Scannel says over at Lampwork etc…I personally think it’s best when it has been frosted with etching solution, but that’s just me…and most of my customers that buy these little beauties. I do know this about “raku” glass, it’s got silver in it and that’s what helps to make the magic happen. Playing with Bullseye’s french vanilla and silver foil you can get some of the same colors coming out. So it appears a bit of sulphur and a bit of silver and ta da…magic. Who knew chemistry could be so much fun! I love these beads. They are just what I have been searching for. Would it be possible for me to get a set? Wander on over to my etsy store if you’d like…beadbrains.etsy.com.